AXS TV is on a mission to find the "World's Greatest Tribute Bands" and on September 9, they find one of the best! 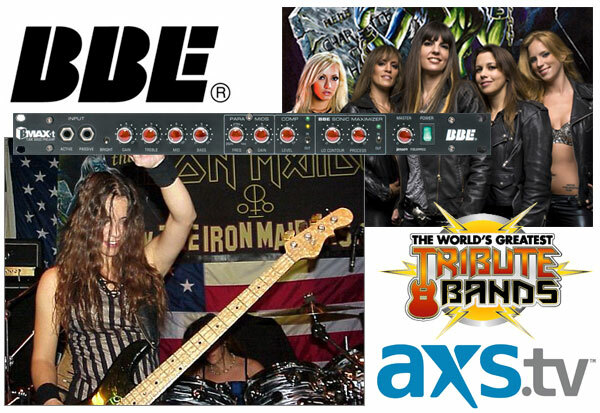 Formed in 2001, The Iron Maidens (an all-female Iron Maiden tribute band) have quickly established themselves as one of southern California's most popular tribute acts and are rapidly gaining international recognition. The band boasts beauty as well as excellent musicianship, a lively stage presence, and a remarkable stage show with theatrical scenes interspersed throughout. First and foremost on the agenda of The Iron Maidens is talent. These women are highly trained professionals with diversified musical backgrounds ranging from orchestral and musical theater to blues and rock. The band and its members have been the recipients of many awards including best tribute band, and best in category (guitar, bass, drums, voice) at events such as The Rock City News Awards, The LA Music Awards, and The All Access Magazine Award Show to name a few. "So, the girls and I will be on TV Monday, September 9. I'll be playing my 'sparkly' blue G&L and they are letting us use our own amps, so the BMAX-T will be there too! Hope you can tune in." We definitely will! Visit www.axs.tv to find out how you can catch the show, and visit www.theironmaidens.com for more info about Wanda and The Iron Maidens.